I will never forget you or your work, no matter where life takes me. After all, I treasure and experience the beautiful gift you presented me everyday. Then someone makes me ponder. A question about what real beauty means to me. I have to narrate to them, the beauty of the footprints. I see the beauty of your work every day. I feel the beauty of your dedication, living and breathing and feel an immense sense of gratitude for every treasured second. Dear Doctors and Sisters – I started this note months ago but could never complete it because it leaves me in tears. 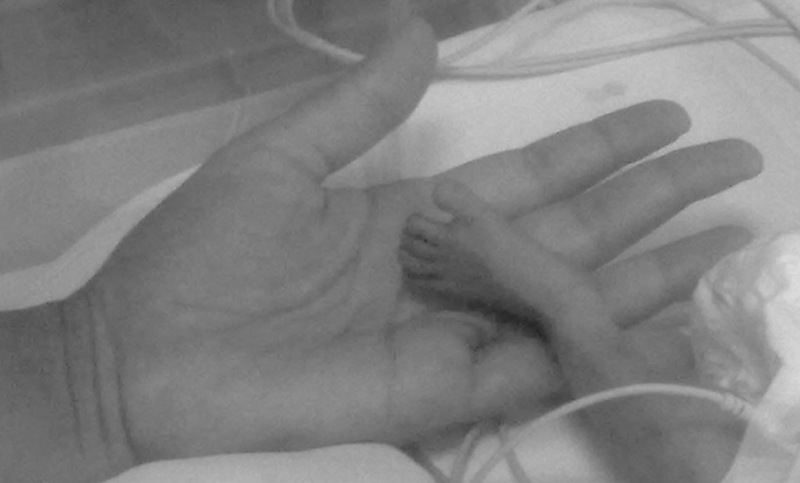 When people talked about micro-preemies I never thought we would be the parents sitting in the NICU wondering if our Son would survive the night. We were there and you were there with us. I saw beauty in the courage you gave us…. I revel in the beauty of motherhood yet again thanks to you. You understood what it is like to leave a hospital without my new born in hand. Each one of you took the trouble to be there for me and give me that beautiful smile every time I was down. I gave birth to my son but you gave him life. Through your dedication and hard work you give hope to parents like me.At the end of our journey together you gave us a new beginning, one which enriches our lives for as long as we may live. You gave us our miracle baby, to love and to cherish and treasure for the rest of our lives. I saw beauty in your gift…. You showed me what real beauty is. You stayed in our lives for a very short duration but you remain in our hearts for ever. I see beauty everyday, beauty in the footprints you left on our soul….. So here is to you and to real beauty. Thanks to yahoo real beauty for helping me pen my thoughts after putting it off for so long. This post is my entry into the Yahoo India and Dove real beauty blogging contest. Do check out yahoo real beauty. Post dedicated to the wonderful doctors and NICU nurses of The Cradle, Bangalore(now Cloud Nine, Bangalore). Ode to the unwritten blog post! It’s high time I wrote again. I’ve been meaning to do this for such a long time. But what do I blog about? Our trips. We’ve been on so many wonderful trips, I can definitely come up with travel write ups. I start a post – Barcelona, a gem on the Mediterranean coast. Two lines and a few hours later, the post is just that, a two line ramble…… The baby decides to wake up and the next hour is gone in feeding and handling him. After his kisses and cuddles, it’s time for the older ones kisses and cuddles. Now, I can’t write when K is being neglected all along. I have to spend quality time with her. I spend a good amount of time with her and she happily skips downstairs to play. I love this about living in India. I don’t organize anything for her, everything is impromptu and the kids play in the play parks downstairs, content. All the classes I’ve enrolled her in are all within the community and she is pretty self sufficient. All this, so I can find some time for myself. Back to my writing, I’ve been stuck at line #3 forever. Now is the time, I’m free and can focus. In walks DH, he’s back early this evening. It’s tea time, I better get tea and snacks going. I finish up with the tea and snacks and it’s feeding time again. Feeding, burping, cuddling all take time and it’s time for K to get back home. I can’t ignore her, so I have to put my writing away and spend some time with her. Once that is done, it’s free time again. I get on the laptop intent on finishing the blog post about Barcelona. I decide to browse for a while to refresh myself. Before you know it, it’s dinner time. An hour for dinner and clean up and then it’s time to start baby’s bed time routine. He is bathed, fed and burped. Both the kids are in bed after their good night hugs and kisses. All that took another hour and now my unedited line #3 beckons me. After a long day, I’m tired. I need something to pep me up. I get make myself a cup of lemon tea. I think I’m getting distracted because I don’t have a writing niche to sit at and ponder. I clean up the spare bed room and organize a cosy writing spot. Now, everything is just right, kids are in bed, all my chores are done and I’m ready to write. I proof read line #3 and edit a few words. Yawn……………. I guess line #4 will have to wait till tomorrow. Good Night laptop, Good Night typing, Good night Grammar, Good night line #4, Good Night blog….. The big day finally arrived. I’ve never been as excited in ages. Today would be the start of a completely stress free and a wonderful break. We deserved it, after working so hard the past year. With a spring in my step, I packed the last of my necessities and put the house in order. Next was getting all my jewellery in a box and heading to the bank locker. The last thing I wanted was to miss visiting the Bank Locker and stress about my precious stones and metals lying in the cupboard unguarded. I made a perplexing observation, my diamond mangalsutra and matching earrings were not in any of the usual hot spots I leave things at. I seldom wear it, but where could it go? Irritated with my absent mindedness and worried about not making it to the bank on time, I decided to recheck all my secret stash spots in my cupboard. One more check turned up empty. Now is when I start to worry. Where did my mangalsutra go? Time to check with DH who is furiously typing away, sending out last minute emails like there is no tomorrow. Me(Calling out to him): Sweet heart, did you see my diamond Mangalsutra lately? Me(trying to not lose it): The diamond one that you got me for our anniversary years ago. The one I wear regularly to office on days I drape sarees. Dh(I know this is a trick question, she is quizzing me): Ooh, that one! Sweetie, I happened to see you wearing in twenty minutes ago. Did you take it off and put it on the dresser? Me(with a tad bit of annoyance creeping into my voice): No that is my solitaire. I’m talking about my Mangalsutra. Dh: Look carefully, it should be in the locker. Me: I checked thrice, it’s not there. Dh: Oh yeah, now I remember. You did visit the bank locker after we got back from my place last month. I think you put it there. Me(trying hard to remember): I can’t remember leaving it in the bank locker but I never leave it there. I always have it handy to wear. Dh(walking into our room and glaring at the now wide open Godrej double door cupboard and locker): Are you sure you didn’t leave it in the Bank? Looks like you did an exhaustive search. Me(trying hard to think): I’m not sure. Dh(who knows my memory quite well by now trying to be supportive): Lets go to the bank. Anyway you needed to leave your jewellery in the Bank. Me(to my ever faithful assistant): A, did you see my Mangalsutra around, the black bead one? Do you remember the last time I wore it? Assistant: Yes Akka, the day you went out with your parents when they were here. You took it off and put it in your cupboard. Assistant: Yes , Akka. I selected your bangles myself. You came back took off your jewellery and put it in your cupboard as usual. Dh(After glancing at the contents of the now ransacked locker): Lets go, it’s not here. Me(grabbing the rest of the jewellery in a rush, mumbling an instruction to my assistant to handle DD while I went out quickly and rushing out the door): I hope it is there. Dh(who has gauged my stress levels by now): Calm down. We’ll find it. Me: Sir, I need to operate my locker. Manager: Ma’am we are closed. We’ve been closed for an hour. Please come back tomorrow. Me: Sir, it is an emergency. I have to check something. I’m flying out for a couple of weeks and would be really obliged if you let me ensure that MY belongings are in order. Manager(Acting like he owns MY locker): Ma’am, everyone has a locker emergency. Come back when we have our locker timings. Me: Why are bank timings different from locker timings? I don’t get it. Manager(losing interest): Please come back tomorrow. That’s our rule. I walk out trying in vain to control my anger, frustration and my overactive tear glands. All I needed was to see DH waiting in the car to burst out and wallow in self pity. Me: I hate this bank. Who operates a bank from 9.30 – 2.30? I’m pulling out my money and my locker. I’m going to an MNC bank. No more wholly Indian banks for me. Dh(with the I told you so look): Come on, cheer up. We are going for our vacation. Is this chain of yours that important? How much can it cost? Is it more important than us? We are celebrating a milestone here, let’s concentrate on that. Remember you wanted to de-stress! Me(Crying harder): OMG, I can’t believe I lost my mangalsutra. How can you even try to put a price to something so precious? My not so dear anymore H(with a quizzical look): I thought we didn’t give undue importance to such things. What’s in a Mangalsutra? Me(Totally ignoring DH and calling my sis): Did you borrow my Mangalsutra since we got back? Sis: No, but I remember seeing it. Remember you wore it when Amma and Dad were around. Me(handing over my mobile to DH and crying my eyes out): OMG, she does not have it either. Dh(talking to sis, driving and trying to control my sobs, all with an air of total calm): The story is your sister’s CHAIN is missing and she is going bonkers. Sis gets out of her all important meeting to rush to my place. En route, she calls me on my mobile. I’m back home by now and totally inconsolable. Sis(really concerned now): Hey, I’m on my way. Will be there in 10 mins. Btw, do you remember putting the blue jewel box in the bank locker? That’s where I saw you putting it the last time you took it off. Me(even more desperately): No, the box is right here but my stuff isn’t in it. God, I lost my mangalyam. This should spell impending doom. What will I do? I’ll have to cancel flights, rebook for tomorrow and go to the bank. Sis: Look once more in your locker. Me(half heartedly): Alright, but I looked there thrice. It’s not there. And then a eureka moment!!! Me(shouting in relief): I found it! I found the mangalsutra and earrings in my locker. It’s not in a box or in the special bowl Amma gave me. It’s just placed in the locker. It somehow got under our passports. Sis: Wonderful. I’m parking downstairs. I’m famished, do you have lunch? Me(mumbling): Who eats lunch at 4.00 PM? Dh(coming into the room): Show me the chain. Then, eyeing it, he sighs. “Oh this one”, he proclaims, like I have a thousand other Mangalsutras. “I didn’t know you were looking for this! I saw it this morning as I took out our passports and put them in an accessible location in the locker”. Me(in utter disbelief,plonking on the bed): I have a terrible headache. I don’t remember crying like this since I was a teenager. I can’t believe this happened on my special day. Me(in my head): I have a husband who does not know what a mangalsutra is! I’m too tired to even sermonize now. Maybe some other time! Sis(walking in): Gosh, you look terrible. Get some sleep. You look like you were hit by a tornado. Of course, I couldn’t sleep. I could not get the ordeal out of my head until I boarded the flight and downed a glass of the great French wine they served on board that night. Jaane Kyu Log Pyar karte hai…..
Well, there is no answer to that question. Why do people fall in love? Why did I fall in love with you? Maybe it was destiny, after all. Maybe we were fated to be together. Maybe we are bound by past Karma. Whatever the reason, I love the feeling. The warmth of your embrace, envelops my soul. The sweetness of your kiss lingers on and brings a smile to my lips even on days you are not around. The sensitivity of your words calm me down and gives me the strength to weather any storm. The small things you do make a difference. The coffee every morning warms my core. I can’t think of ways to thank you for being there for me, time and again. Why we fell madly in love is a mystery but I think I know why I continue to stay in love with you. Zindagi ki safar mein hazaaron humsafar mile, ek hamrahi………You are my true companion, without you the journey of life would have been incomplete. Thank you for being my travel mate for the past decade. I love you with all my heart. You: You will realize when you have a child of your own and she does this. Me(all of seven): I will never force my child to do what I want to do. I will give her a chance to use her own brain and decide. You: I am your mother, I know better. Just do what I say. It is for your own good. Me: I don’t want to. You: I don’t care if you want to or not, just do it. Me: I just want to play, let me play. You: You have played all day long, if you don’t finish your meal NOW you will get into trouble, BIG TROUBLE. Sulking Me(In my head): When will I have the freedom to do what I want to do, not eat my meals and get away with it. I can’t wait to get out of here. Mind Reader that you are : You will realize all this when you go away, have a family of your own and don’t have me around to fuss and fret over you. Now finish your food before Achan gets here. Me(Crying and choking on my food): You don’t love me. What do you do for me? You are always yelling at me. And this saga continued day after day way into my teens. Wonder where you got all the patience and energy from? Your Grand daughter is roughly the same age as I was and we have been having this ongoing discussion for hours. Me: Do what I’ve asked you to and then watch TV. Your Grand-daughter: Amma, let me watch TV. I can’t do it now. Me: Do as I say, I know what is good for you. Your Grand daughter: No, I will do what I want to do. Me: I am your Mother, I know what is best for you. Too much of TV is definitely not good for your intellect. Pick up your journal and start writing. Your Grand-daughter: I DON’T want to write. I don’t like to write. Me: Remember what Ms. N said? You need to keep writing daily to improve your handwriting. In India it is important to have a good handwriting. Your Grand-daughter: I don’t care. I don’t want a good handwriting. Me: PICK UP YOUR JOURNAL, NOW!!!!!! Your Feisty little Grand Daughter: I am NOT going to write. I have nothing to write about. Me: Sit tight for ten minutes and you will come up with something. Think about our recent vacation at your grand parents place. Write about the Vela or all the mango trees in Ammamma’s house. Your GD: I don’t want to write, I’m BORED of writing. Me(Almost losing it): I DON’T CARE FOR YOUR BOREDOM. IF YOU DON’T PICK UP THE JOURNAL RIGHT NOW YOU ARE IN BIG BIG TROUBLE. Your Grand daughter(with tears flowing down her chubby cheeks): You don’t love me, you don’t even like me. You bother me all the time. Me(on the phone): I’m EXHAUSTED. Mothering your grand daughter is the most stressful job in the universe. You: It’s ok, kids who are troublesome while they are little always turn out to be loving supportive children. You wait and see when she grows up she will be the best kid out there. Me: She is so stubborn, she drives me up the wall. I mean, she cried for hours before touching her book. Have I EVER troubled you like this? You: No way, you were such a good kid. You were NEVER stubborn. I am shocked your daughter is like this. Now your sister is a different story, I’m pretty sure she has taken after her aunt. You don’t worry. Soon she’ll grow up and understand. Me: When is she going to grow up? I can’t wait. You: Don’t hope for that. They grow up too soon as it is. Enjoy every minute of it for soon she is going to grow up and go away and then you better not have any expectations from her. Me: *sigh* You are right! How is it that you are always so right? I Love you even more after experiencing Motherhood. I don’t need Mother’s Day to remind me of the invaluable gift in my life called Amma. Not a single day goes by when I don’t think of you and everything you did to raise us. Even though we are not always on the same page, you are always in my heart. Here is wishing you a Happy Mother’s Day in advance. The Nemmara Vela 2009 is an unforgettable experience. Not only did I get to participate in the festivities, I also got to experience the fireworks, a first for me. As usual the festivities began with all the pomp and vigour. On a positive note, neither was the heat index as high as last year nor did it rain. Excellent panchavadyam was music to every aching ear, heigtening each of my senses and transporting me to a greater world. If I could choose from my entire life, all the episodes where I have experienced heaven on earth, this panchavadyam is definitely going to be somewhere on top of that list. As usual, Bhagavathi’s thidambu was beautiful, personifying her dignity and elegance. The “thidambu ketal” ceremony at Mannath Temple was great to watch. It gets better every time. The magnificient pachyderms stole the show, atleast from the point of view of the petite participants. All of them were awestruck by the eleven elephants at the Vetaikorumagan ksehtram. Both the pandals were pieces of art. It seems bad that they are coming down as I type this but then if history is proof, the next ones will beat even these. As a grand finale, the night sky errupted into hues of dazzling colours. My little one was more interested in knowing the winner of the fireworks display. I personally liked both, one for the accoustic effects and the other for the pyrotechnique display. 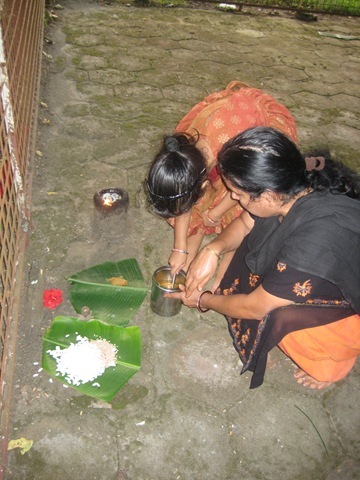 This Vela is a significant event in our calender and if you go by the sea of people thronging Nellikulangara Kaavu on the two days, it is understood that many hold the same sentiments. I am inspired to create an entire writeup on the Vela after interviewing DH’s Ammamma. That is definitely in the agenda for a future post. Note: Pictures and videos are definitely on the way, as soon as I get back to my broadband. From "Ja Ja Boo" to "Double U"
From “Cha cha” to “Achaaaaaaaaaaaaaaaaaa, Acha“. From “fril fril” to “Give me some Curd“. From “Tutta Tutta” to “Amma, I want eggs for breakfast and please don’t give me the yellow”. From “I Lava OO” to “I Love you” (Now is more of – “I Love Akshay Kumar” and the subject is changing every week). From “No Spanish” to “I understood what you just spoke in Hindi/Kannada/Tamil/Malayalam”. From the first crawl, to the first steps, to the first bike ride. From the first letters to the endless princess stories. From the first gummy smiles, to the one toothed grins to the toothless wonder that you now are. The list is endless and we have savored every moment of it. Happy Birthday my little Princess! Achan wishes to be the only guy in your life for a LOOOOOOOOONG time and Amma wishes to have a jar that could hold every memory for you will soon fly away to build your own nest.